Today is a guest speaker from Dr Becker. You can visit the original article and video here. Today I’m talking with Dr. Joyce Harman, who is one of the top equine veterinarians in the country and perhaps even the world. My veterinary expertise is specific to small animals and wildlife, so I’m really excited to have the opportunity to talk to a holistic equine specialist. Dr. Harman says that at a very young age she decided she wanted to be the first-ever female horse vet (she didn’t realize there were a few already out there!). She ultimately achieved her dream. But like so many DVMs who’ve added holistic therapies to their veterinary toolbox, there came a time when Dr. Harman felt she wasn’t making enough of a difference for her patients by confining herself to the practice of conventional veterinary medicine. She had cases she couldn’t solve, and a niggling sense that there were answers out there — she just had to find them. That’s when she got interested in acupuncture. In 1990, Harman opened an equine practice in Virginia, and before long, it became entirely holistic. These days her Harmany Equine Clinic offers acupuncture, chiropractic, homeopathy, herbal medicine and other alternative therapies to equine patients. 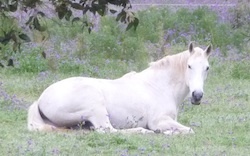 Many Harman’s horse patients suffer from lifestyle-induced illness, including lack of exercise and confinement. “Horses are designed by nature to walk 20 hours a day seeking food and water,” she explains. “They only rest [four] hours a day.” Many horses owned by humans are confined to stalls for 12, 14 or 24 hours a day. “They are fed rich foods,” she continues. “They are fed genetically modified (GM) foods. They are fed high-sugar foods. They become obese. They don’t get enough exercise to keep their joints healthy. This sounds cruel to me. Dr. Harman agrees that it is. It’s like keeping a dog in a crate 20 hours a day. Stalls and crates have their place, but they should never be used to confine an animal for hours and hours every day. Confinement creates stress in horses. Stress, in turn, causes ulcers, which are a common problem in today’s horses. Weight gain leads to obesity and related disorders, including laminitis, or inflamed hooves. Laminitis is an extremely painful and potentially life-threatening condition that can make walking impossible. “Organic foods can be very difficult to get for horses. But oats and barley are non-genetically modified. There’s a company called Triple Crown that has a non-genetically modified line of feeds. We are starting to have options in commercial feeds. We can get hay, in many cases, that hasn’t been sprayed with pesticides or herbicides. We can turn our horses out more. People are doing creative pasture arrangements where the horses can move throughout the day. They fence off a round track so they can walk around, eat and drink as they go. Along with patients suffering from lifestyle-related issues, Dr. Harman also has patients whose owners are looking to start out on the right foot in keeping their animals healthy. Part of Dr. Harman’s proactive approach to keeping her equine patients well is a modified vaccine protocol. Traditionally, horses are very heavily vaccinated. “There’s a thought process, even among more holistic equine vets, that horses need to be repeatedly vaccinated because they don’t hold a titer very well,” says Dr. Harman. As an aside, I’ve heard this as well from members of the veterinary community. Titers work to measure the immunity of dogs, but they don’t work for horses. But as Dr. Harman explains, she’s been doing titer tests on horses for 25 years. And she’s done them as often as yearly for animals in boarding situations who are required to have either a vaccine or a titer test. Bottom line, “They maintain their titers,” she says. “There are certain vaccines for which they don’t have a very high titer response — typically these are vaccines that just aren’t very effective.” The same thing occurs with certain canine vaccines, by the way. I asked Dr. Harman if her equine patients tend to have longer lives as a result of a healthy lifestyle. Is Genetically Modified Beet Pulp Behind the Epidemic of Ulcers in Horses? “Gut disorders are probably our No. 1 or No. 2 issue in the horse world — especially ulcers. We have ulcers in horses at every level of activity, from racehorses to backyard horses that don’t do much. We have to wonder why that’s happening. I asked Dr. Harman about feeding GMO corn to horses. There’s the GM aspect, of course, but I also suspect feeding corn to any mammal is not a good idea. Corn is a high-glycemic, high-starch carbohydrate. I know dogs can get fat and develop diabetes by eating corn. Dr. Harman explained that horses are natural grass eaters, and corn is in the grass family, so technically they can eat some corn. If a horse found some corn growing in the wild, for example, he’d eat it. It’s when corn is fed as a concentrate that problems arise. Since it’s high in starch and carbs, and since most horses aren’t exercised enough, it can contribute to obesity. However, a non-GMO or organic corn can be a small part of a horse’s diet, according to Dr. Harman. Luckily, she knew a few people who were saddle experts. “I became obsessed with saddles and eventually wrote a book that’s really the only independently written book about saddle fitting,” says Dr. Harman. “As I studied saddle fit, I was blessed with more teachers who taught me about riders, rider fit, rider balance and saddles,” she explained. “It really is one of the largest contributors to poor performance syndromes, and costs the industry millions of dollars. Dr. Harman has an eye for saddle fitting. She says it’s like fitting a shoe to someone’s foot. She tries it on the horse. She puts the horse in motion while wearing the saddle. And ideally, she likes to see the rider in the saddle, because many saddles may fit the horse, but not the rider. In fact, a lot of riders develop back problems because their horse’s saddle doesn’t fit. It’s about making the puzzle pieces fit, which isn’t as easy as it sounds, due to the infinite number of combinations of saddles + horses + riders. Horses’ backs also factor into the equation. Some horses have wide backs, others have narrow backs. A person can try 25 different saddles on a horse before they find one that fits. Dr. Harman also works with custom saddle makers. Sometimes a custom-made saddle is the only answer for a horse with a difficult-to-fit back. So if you want to learn how to fit a saddle, you can get a copy of Dr. Harman’s book at Harmany Equine Books & Information.”People have written me letters and said ‘I can do this’!” says Dr. Harman. Many Thanks to Dr. Joyce Harman! I want to thank Dr. Harman for a very insightful interview. This has been sort of a “Horses 101” class for me! I definitely want to have her back again soon because I get lots of mail from Healthy Pets readers asking for more information on horses. So hopefully Dr. Harman can joint us again in the near future to discuss metabolic diseases and other equine topics.